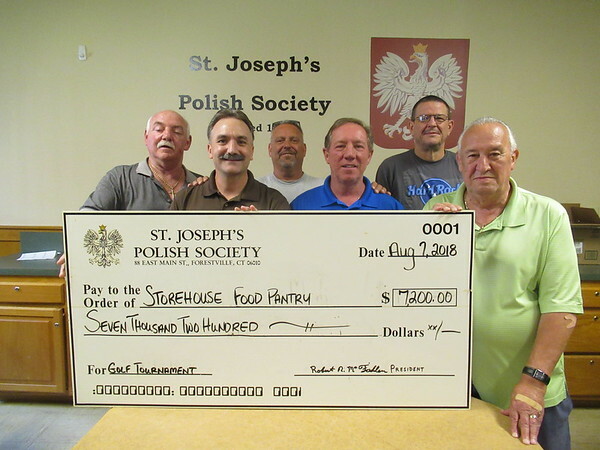 BRISTOL - The members of St. Joseph’s Polish Society recently presented the Christian Fellowship Center with a $7,200 check Thursday to support its Storehouse food pantry, clothing ministry and soup kitchen. The society, in Forestville, raised the money in June through its 10th annual charity golf tournament, with the help of club members, community volunteers and local businesses. Over the past decade, the society has donated over $87,000 to the food pantry and soup kitchen. “We have fun every year, too,” Desjardins added. The Storehouse has been one of Connecticut’s largest food providers for the needy for 19 years. In 2017, the food pantry gave out 380,000 bags of groceries, served 32,000 hot meals, and distributed over 600,000 pounds of food. Every Wednesday morning, it gives out food and clothes to families in need, and every Friday, Saturday and Sunday, the soup kitchen serves hot meals. The Storehouse has recently expanded its food pantry and dining area to feed people more efficiently. It was also selected to be one of three agencies in the state to be used as an emergency facility for distributing food during major power outages due to storms or other natural disasters. Through Eversource and Foodshare, it was awarded a grant for a generator for use during major power outages. The 11th annual St. Joseph’s Polish Society Charity Golf Tournament is scheduled for June 7, 2019. In addition to the golf tournament, the society sponsors Mel’s Run, which benefits Connecticut Children’s Hospital. In the 13 years of that charity event, St. Joseph’s has raised over $100,000. In the past, the society has held cookout events to raise money for autism research. It also gives out two $1,000 scholarships each year. Posted in The Bristol Press, Bristol on Tuesday, 7 August 2018 20:33. Updated: Tuesday, 7 August 2018 20:35.